It has been the goal of drum manufacturers and drummers alike to realize the development of a truly free-floating drum. A drum design that would insure maximum resonance and purity of sound. Though many attempts have been made, all have fallen short of three basic requirements. A shell suspended and held in place only by its bearing edges in contact with the upper and lower heads, allowing the set to resonate fully. A shell completely void of hardware contact that would impede its resonance. The ability to maintain tension of the upper and lower heads to unequal degrees of rigidity. Downing has succeeded where others have failed, making a reality of what others have only dreamed of. 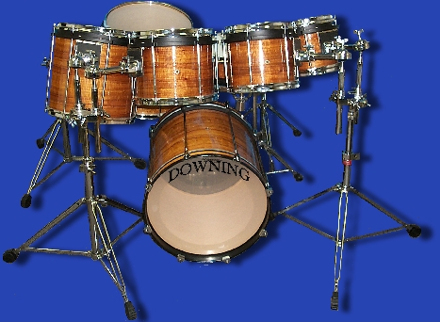 Downing's new 4-D design offers you the ability to custom order a drum set with your own unique look and sound. Our design removes many of the inherent restrictions of conventional drum design. Not only do we offer you more choices than any other company; we offer you the opportunity to create your own sound. Our staff is fully trained to understand your individual needs and custom design a sound that is truly yours. This is NOT an off-the-shelf drum set. All drum sets are individually handcrafted in the USA, numbered, and registered to you, the owner. To contact Downing Drums click here downingdrums@gmail.com or go to website.